Brown spots also known as solar lentigos result from years of unprotected sun exposure. Those lesions can occur at any age but tend to get worse after the age of 40. The face, hands and décolleté are most commonly affected as they are most exposed to the sun. 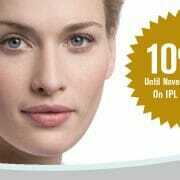 It is now possible to reduce if not erase those unsightly brown spots and give you back your normal skin color and glow. This month’s promotion at Medime features the IPL M22 and Enlighten combo targeting both superficial and deep pigmentary lesions for maximum results on most skin types. The IPL M22 photorejuvenation device uses intense pulsed light (IPL) to treat conditions related to sun damage. The M22 light energy is selectively absorbed by melanin and unlike other IPL devices causes little to no inflammation. It is therefore considered a lunchtime procedure and causes little to no downtime. The IPL M22 is the ideal laser for treating surface brown spots. The Enlighten laser uses nanosecond and picosecond technologies to treat the deepest and most stubborn spots. The picosecond energy pulses fragment and shatter abnormal pigment which gets expelled naturally through skin exfoliation. A complete assessment and diagnostic evaluation by our experienced team is required to determine the best treatment plan for each and every patient. Patients require a series of 2 to 4 sessions on average depending on the severity of their condition. Treatment sessions are usually spaced 2 or 3 weeks apart and appropriate skincare and sunscreen is required throughout the treatment period. When do results start being visible? In general, the brown spots first appear darker after the treatment and then gradually fade with natural skin exfoliation over days to weeks. For more details about our promotion on IPL M22 and Enlighten treatments, please contact one of our Medime team members at 514 739-7444 or complete the form for a free consultation. Signature MédIME treatments for treating cellulite, toning the skin and remodeling the body.